Southern Africa has an impressive selection of venomous snakes and a large number of species which while either non-venomous or only mildly venomous are easily confused with the more seriously venomous species. Consequently accurate snake species identification is particularly important in southern Africa. Johan Marais’ “A Complete Guide to the Snakes of Southern Africa” is a leading reference work on this subject and has given rise to the Korck Publishing wall poster “Snakes of Southern Africa – Dangerous Snakes and Common Harmless Snakes” which together with its Fold-out Identification Guide equivalent (folding to 298 mm X 238 mm and thus sufficiently portable to be an essential component of every hiker’s or outdoorsman’s equipment) “Snakes of Southern Africa – An Identification Guide to Dangerous Snakes and Common Harmless Snakes” has become a major snake quick identification guide throughout southern Africa. 44 Snake species are shown using photographs with the backgrounds removed to clearly show each specimen. Distribution maps for each species also aid identification. Each species is marked with one of three danger classifications, or if harmless. This poster will adorn any wall at home, in the waiting room, at the office or in school or university. It will make a perfect gift for everyone interested in nature. The wall posters measure 900 mm x 594 mm (35.4 x 23.4 inches). The poster are double laminated (ie laminated both sides) for ultimate protection and will be shipped to you in a sturdy postal tube. Many of our customers throughout the world choose to frame or blockmount their posters such is the quality and impact of the posters themselves. The Fold-out Identification guide features a First Aid Section and Venom Classification for all dangerous species. 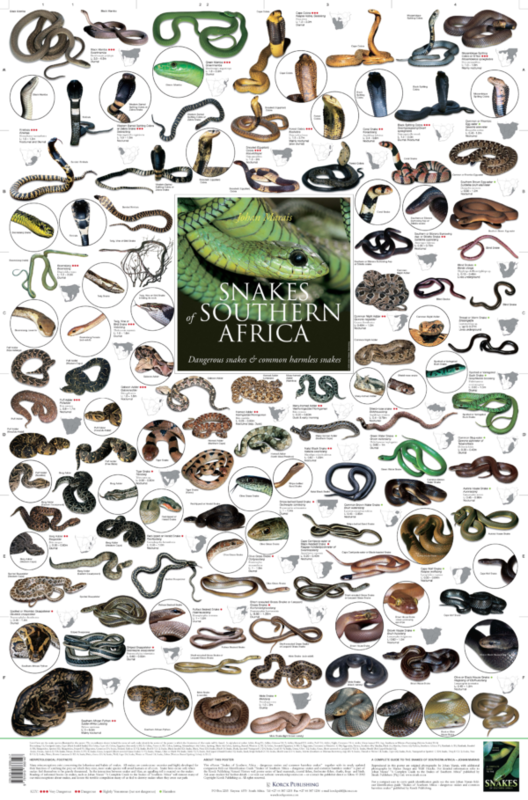 Click here to read more about the Snakes of Southern Africa Fold-Out Identification Guide.